The mainstay of the treatment of brain tumors is surgery. Other supportive therapies like chemotherapy, radiotherapy etc. helps in disease free survival. No medical management is available to treat brain tumors completely. Some drugs are used to reduce tumor edema (steroids), treat seizures and headache but have no role in treatment of tumor itself. It is the mainstay of treatment. The aim of surgery to remove mass effect, get tissue for histopathological diagnosis and excision of mass to cure the disease. Surgery aims at total or gross total excision, but in case of inoperable tumors (eloquent areas) near total excision or simple decompression is also done. Surgery causes immediate relief in mass effect. Benign tumors are usually cured by surgery itself but malignant tumors require chemotherapy or radiotherapy as an adjuvant. Recurrence is the rule in case of malignant brain tumors but recurrence free survival depends upon the type and grade of the tumor. Even after recurrence, surgery is the first line of management. Now a day, advances in surgical techniques facilitate more excision with less deficits and morbidity. 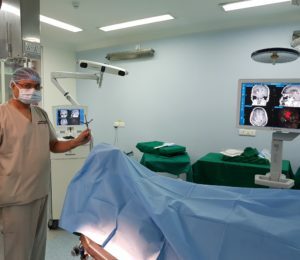 Tractography, neuronavigation, CUSA, intraoperative MRI, flouroscine microscopy, intraoperative neurophysiological monitoring are few advances in surgical techniques which improve the result of surgery. 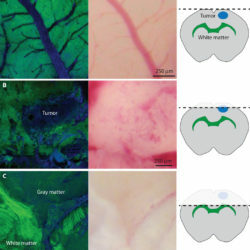 This is recent advance in surgery of brain tumors in which there is computerized software based mapping of tumor and its relation to various eloquent brain areas, blood vessels, tracts and neuron bundles is done. Preoperative MRI, functional MRI and DTI (Tractography) is used to prepare a 3D map of tumor with its surrounding structures. It also helps in deciding the territory through which tumor can be approached easily. Using it, we are excising the tumors which are considered inaccessible due to its location near eloquent and important structures. As a result, maximum possible reductions of tumor load with minimal or no neurodeficits is offered to the patient. This is also recent practice in neurological surgeries. Many tumors are located in such areas where any attempt to excision may lead to permanent neurodeficits. 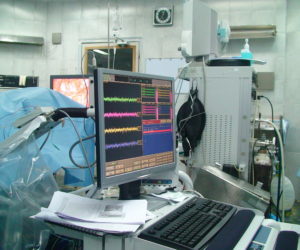 Intraoperative neurophysiological monitoring is real time recording of various brain activities during surgery. Even touching of important structures immediately reflects as changes in NP monitoring and those structures can be saved and deficits can be avoided. This results in safe excision of tumors. Use of high resolution microscope with some additional features greatly facilitate in identification and safe excision of mass. Some tumors like gliomas are very difficult to be differentiated from normal brain tissue even by simple microscopes. This results in excision of normal brain tissue and deficits. Injection of Fluorescein dye with view under specific wave length highlights the tumor distinctly from surrounding brain tissue and makes its excision safe. But this feature is available in selected microscopes. 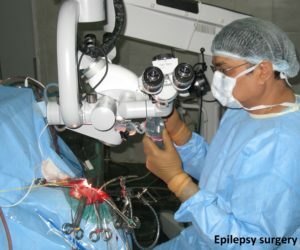 This is a type of focused radiotherapy which delivers computer software based, multiple source high dose of radiation to the small diseased area of brain without affecting surrounding brain tissue thus avoiding side effects of whole brain radiation. The tumors which are inoperable or inaccessible can be treated by gamma knife. This has limited role in brain tumors due to presence of blood brain barrier. Few chemotherapeutic agents like temozolamide, carmustine, CCNU, procarbazine, cytarabine, vinblastine etc. are effective against brain tumors. The modality is usually used as adjuvant to surgery. This is also adjuvant to surgery. As alone it has limited role but potential side effects in form of radiation necrosis. This is in juvenile phase. Few molecules are developed to target molecular pathology of the tumor.